The Amaze, in its first generation was Honda’s shot at the sub-4 meter sedan segment, based on its learnings from customers who bought cars a segment or two above. A manufacturer of ‘premium cars’ as the Japanese carmaker likes calling itself in its official releases, was trying to understand a segment which it didn’t have much experience with in India. 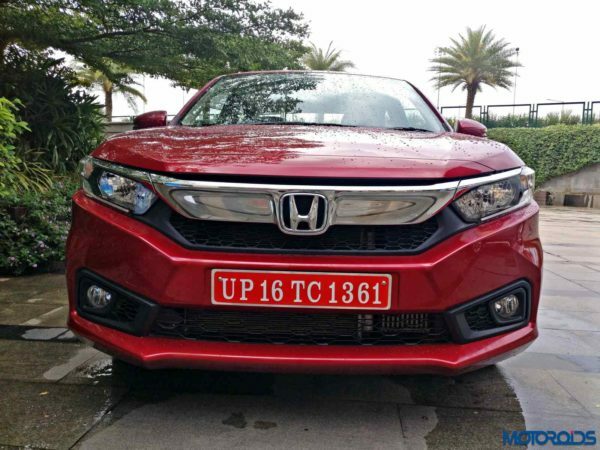 The Amaze, though, was a success, and Honda’s brand image, along with a balanced product with good pricing made the Amaze a success in the Indian market. For the second generation 2018 Amaze, Honda asserts that they have done extensive market research to create a product that’s best suited for its class. The new Amaze is the culmination of Honda’s dedicated efforts to create a product for the sub-4 meter class, which according to them will ‘surpass’ the expectations of the segment. So is it, really, such a well researched, ground-up product, which has the capability to shake up the segment, or is it just a re-hashed version of the previous gen car? We spent a action packed day with all four variants of the new Amaze, and in this review, will try to answer all your questions about the car. fasten your seatbelts then – it’s going to be a long, but interesting ride. The new Amaze, to an automotive design purist may come across as unarguably disproportionate from the front. It’s got a brawny, sculpted, almost slab-like face, which in theory doesn’t lend itself very well to the sedan segment – defined mostly by subtle styling and organic lines. That front, however, is the biggest proof that Honda have indeed gone out and done extensive market research before making that car. I know this for a fact now and here’s why. When I first saw the car at the 2018 Auto Expo, I instantly disliked that chopped out front with that massive grille, and said as much in my video. However, almost instantly, the viewers and fans at Motoroids started lambasting me for having criticised such a ‘nice-looking’ car. Most of you liked that muscular front and I was quite literally ‘Amaze-d’ at seeing such solid support pour in for the car. Now, being a devotee of the great Steve Jobs, I don’t believe much in the concept of market research, but the huge support for the car’s design did make me realize that Honda’s probably got it right from the people’s choice perspective, even if the product doesn’t adhere with the conventional auto design rulebook. So there we are, with that solid looking face, which is bold, not just in the way it looks, but also in terms of the gamble that Honda has played with that sort of unconventional styling. Honda, at the product briefing session, did go a step ahead though, and explained to us the logic behind giving the new Amaze its unique styling. According to their study, people wish to see strength in their cars, even if they are sedans. They want to be reassured, visually, that their car is built solid to be able to take in its stride the ever present broken roads, big speed bumps and rough surfaces. So, as a design concept, the Amaze set out to look sturdy, solid, rugged and tense at the bottom, while the top still had a sloping, sportily styled roof. So then, the front now gets that solid looking face, with a big, wide chrome grille with Honda badging, what Honda likes calling the ‘wing face’. In its newest avatar, the Amaze also gets a pair of LED position lights though the headlamps are still usual halogen bulbs with reflectors – no projectors here. Overall, the sculpted, angular front is very unusual, though our experience tells us that a lot of people on street tend to like it. We’d be very happy to know your thoughts on it as well, so do let us and Honda know your thoughts about it on social networks. Things get much better as you move towards the side, though. To start off, the wheels have been upsized to 15-inches from the previous 14 and they look rather smart. Shod with 175 section BridgeStone rubber, they offer great solidity to the car’s ride and handling too, but more on that later. The ORVMs have sleekly styled winkers and the sloping roof gets a shark fin antenna in place of the usual wire antenna. The straight cut, angular theme runs through the side of the car, and there’s a pronounced crease that spans the headlamp and the tail-lamp. Also prominent on the sides is the bonnet shut-line gap, which has been kept there deliberately to add some more drama to the styling at the sides. 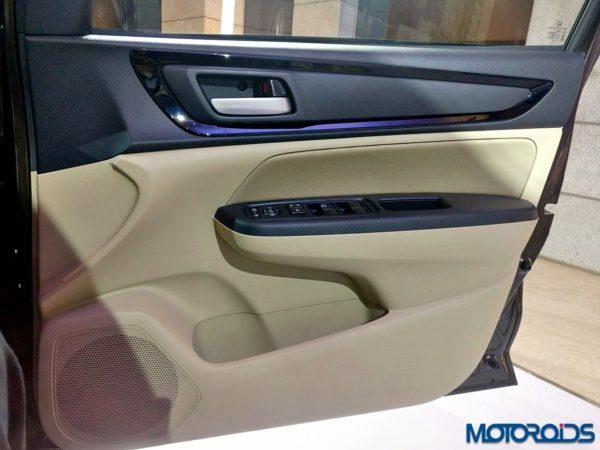 The body coloured door handles get a soft touch buttons to facilitate keyless locking and have sensors for keyless entry as well. It’s from the rear that the Amaze looks the best to us though. Those angular wide-set tail-lamps with an extended, albeit sharper and inverted WR-V like C units makes that rear look wide, imposing, and visually appealing. A prominent boot lip line, a strong line joining the tail-lamps horizontally, a recessed registration plate area, and small wing-like extensions on the lower part of the angular bumper define the Amaze’s rear. We like the way the Amaze has been finished, though to us, the whole design is still a little too nonconformist to fully admire and appreciate. It’s driven by research though, and as I mentioned before, I have seen the proof in audience’s approval as well. 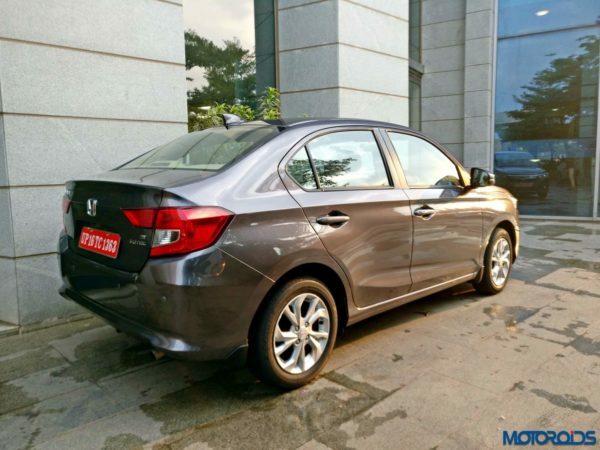 So it seems, you, the users have ordered Honda to make the new Amaze the way it looks, and hey, who could argue with that? The first thing that you’ll notice as you enter the Amaze’s cabin is that the ambience is very warm, fresh, and welcoming. There’s a sense of open, spacious niceness about this cabin, and it’s not achieved by fluke. 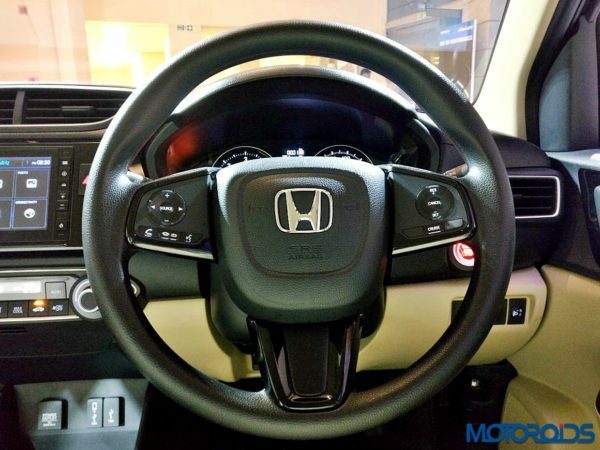 Honda has worked extensively on making the cabin look spacious, with a wide, horizontally laid out dashboard and their hard work shows in every detail. What is particularly impressive is a very tasteful selection of colours as well as materials and they’ve all been put together in a very classy, clutter-less way. The cabin on the new Amaze radiates a positivity that is going to be one of its strongest selling points. The black-beige interior with Piano black inserts for the dash, centre console and door panels and textured beige upholstery reeks of a quality, premium feel. Finish is as good as the quality of materials themselves and there are absolutely no rough edges to that cabin’s finish. The new Amaze finally looks like what a proper Honda should look like from the inside. Our only complaint with quality is the headliner, which seems rather flimsily attached to the roof, and can be pushed back into the ceiling – it doesn’t quite match the solid, fine feel of the rest of the cabin. The quality of materials has gone up significantly. Right from the black plastic on top of the dashboard, the beige plastics on the bottom part, the mirror finish piano black material, to the satin grey door pulls, everything radiates fantastic quality. The three spoke steering feels nice and chunky to hold and is designed ergonomically to reduce the strain on wrists, no matter which angle you’re holding it from. The instrument console is all new too, and radiates a mature, sophisticated look, rather than trying to do something too funky. It gets a black dial with white backlit markings, and comes with an information-rich central MID. It really looks nice and polished – very functional, very legible and very sophisticated. 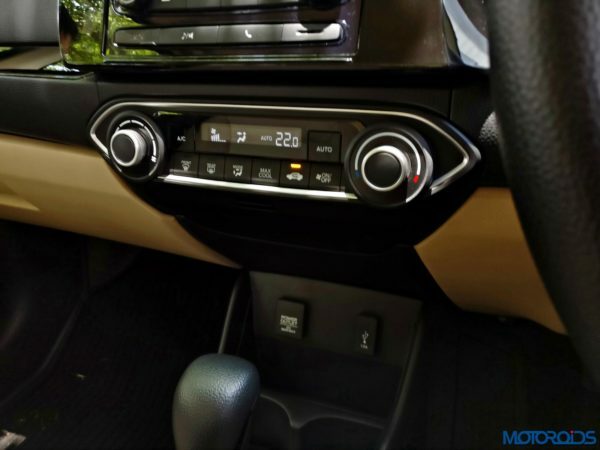 The centre console on the top-of-the-line VX variant comes with a large touch-screen infotainment system which is simple to use and is Android Auto, as well Apple CarPlay compliant with a 1.5 Amp USB socket provided under the centre console panel. It also gets in-built navigation, which is a nice feature to have. The interface is easy to use and the passenger can use the screen to play videos as well. It can be connected to via Bluetooth and plays through a USB device as well. The resolution and touch feel is not the best in class though, and could have been a bit better. The top of the line VX variant gets a reverse parking camera as well, while the lower V variants get parking sensors. 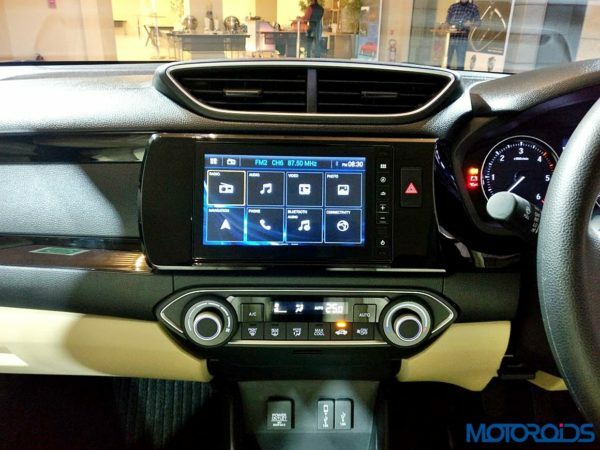 The V variant’s infotainment system is a non-touch unit which is also reasonably feature rich and sounds the same. In terms of sound quality, the system is par for the course, though there’s nothing spectacular here. We saw Alpine branding on one of the remotes, and the four speaker system sounds balanced and has good bass till a little higher than mid-level volume. Turn up the volume to higher levels, and you can make out that there’s distortion. 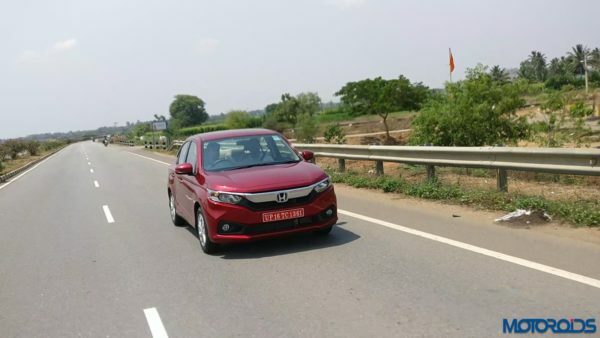 AC is another thing which Honda has worked extensively on, and the Amaze’s AC is now even stronger, and chills quickly. The rotary controls for the AC, as well as the buttons have a very solid, positive feel to them as you use them. 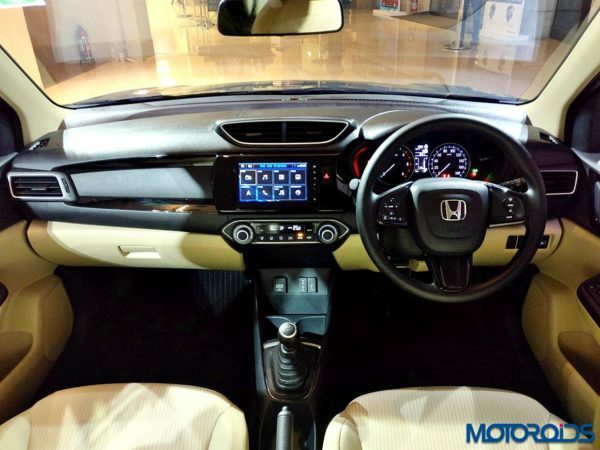 The design of the AC panel, as well as the way it feels when you use it, shows the amount of effort Honda have put in to make the user feel the quality at every touch. The whole instrument console is slightly tilted towards the driver to aid reach and ergonomics. Under the centre console you have a 12V power socket and two USB sockets (one 1.5 Amp and another 1.0 Amp) for Android Auto / Carplay and normal USB input respectively. Underneath those two sockets, is a storage space that further reflects the fact that this car has been built with a lot of market research with the Indian customer. A large, open crevice with space to swallow a big cellphone and a wallet, spells great convenience. It has a connected twin cup holder following it, which, again, can be used to put stuff other than just cups. The manual transmission’s gear lever is surrounded by a layered rubber cover which looks very nice, though the auto variants get piano black around the drive selector. There’ another recess under the handbrake, which, by the way is again finished in nice, soft to touch plastic and feels nice to hold. 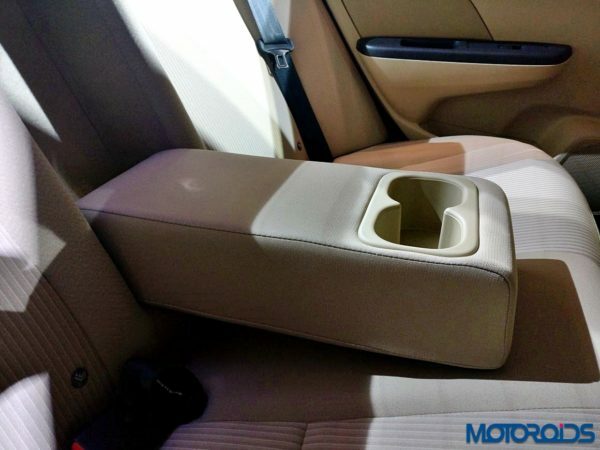 Finally, there’s a bottle holder, which is large enough to accommodate a one litre bottle, and can be used by both front and rear passengers. The front door panels get large bottle holders, and can easily accommodate bottles even larger than one litre capacity. There’s more space on the sides, as well as a crevice on the arm panel to put your wallet. The glove-box is reasonably sized too. From a space perspective, one thing we loved about the central panel is that it’s been designed in such a way that nothing fouls with the knee. Even really tall drivers would realize that there’s ample space for their knees and it won’t foul with any panel, which is often a problem with a lot of cars. The driver’s seat is height adjustable, and the all round visibility is pretty good. Front seat comes with side bolstering, and provides good back and thigh support. They could have been wider though, and those with a large built will probably find these seats small. Even the padding could probably have been slightly more firm. Those seats are nice though they’re not the best in class. The steering wheel gets mounted controls for audio, as well as voice commands on the left side. On the V variant, there’s nothing on the right spoke, though the VX variant gets buttons for Cruise Control on the right panel. The buttons on the steering is one of the very few things that probably could have been a little better in terms of quality. The steering by the way is adjustable only for tilt and cannot be adjusted for reach. The Amaze also comes with power adjustable and power folding mirrors. In terms of safety, the Amaze comes with twin front airbags, with the driver side airbag having special smart deployment functions, and is termed as the I-SRS airbag. ABS is also standard. The variant we tested also had ISOFIX mounts for child seats though the rear passenger has to make do only with a lap belt. 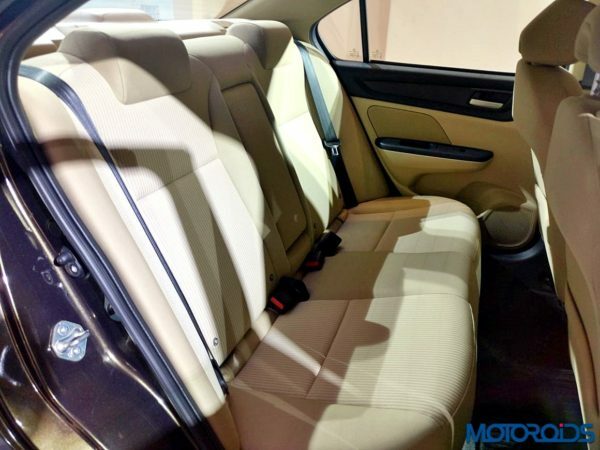 All that increase in the space is quite evident as you climb into those rear seats. Ingress and egress is quite easy too. There’s ample knee room and legroom for the class. Headroom could have been better as the Amaze is still the shortest car in its segment, and with that sloping roofline, those who are taller than 5’11” may find their heads brushing with the roof. The seat comfort is par for the course, though the integrated headrests should have been replaced by proper adjustable headrests. You cannot seat three abreast as the width isn’t sufficient. 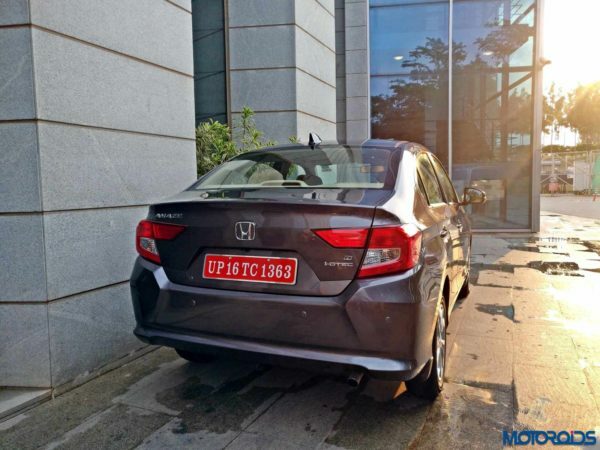 The rear passengers get a power socket, though there is no AC vent for the rear, as Honda thinks that the new, more powerful AC is sufficient for cooling the cabin. The seats are not 60:40 split either. 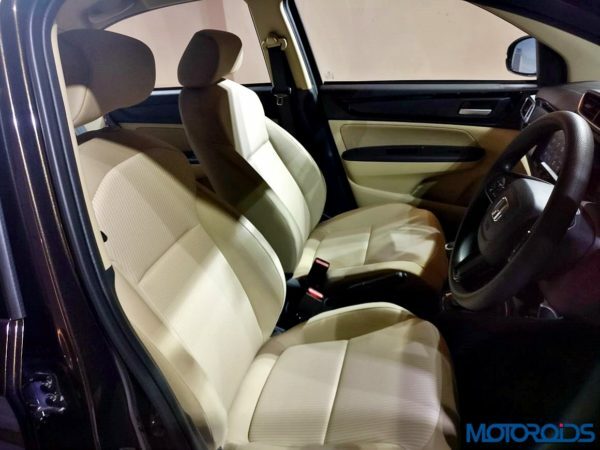 Overall, the sense of space and comfort at the backseat, for all practical purposes is pretty good, and an average family of four would find the cabin very comfortable. 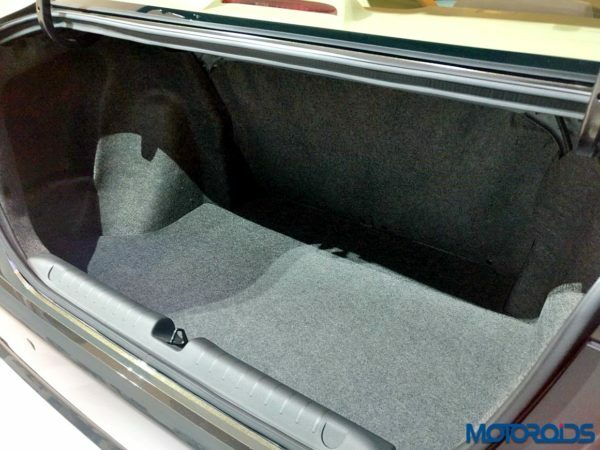 The boot space on the new Amaze has been increased too, and it now packs in 420 litres, which is class leading, and significantly higher than that of the Dzire. The new Amaze continues to be powered by the 1.2 petrol i-VTEC and 1.5litre i-DTEC engines, albeit with several improvements for better efficiency, lesser friction and lower NVH levels. 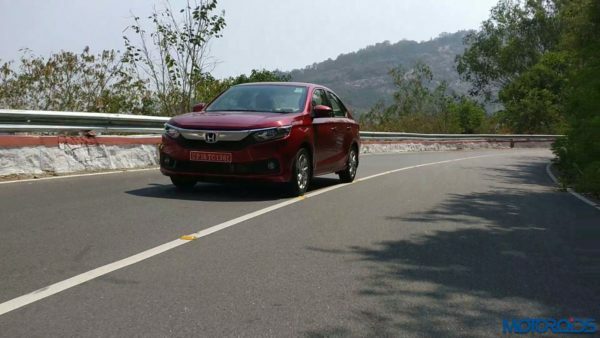 The two engines also come with the option of a CVT now, and we tested all four variants during our drive. Here’s a breakdown of how the reworked engine-transmission combo feels on the go. The 1.2 litre i-VTEC on the new Amaze has been tweaked and now features a low friction zigzag coating on the piston skirt area for lower friction. In addition, technologies like molybdenum shot metal and low friction oil seals have been introduced to further increase the efficiency and reduce slide friction. The result is higher efficiency and in the manual variant, the petrol engine delivers an impressive ARAI efficiency of 19.5 kmpl. The 1.2 litre petrol unit is dependable as ever, with reasonable tractability at the bottom end, which turns into a more reassuring pull at 2000 rpm. The engine, with 90 PS of power at 6000 rpm and 110Nm of torque at 4800 rpm comes into its own after 3500 rpm, and then pulls cleanly to its 6500 rpm redline, and crosses it to reach 6750 rpm when the limiter finally cuts in. It’s a potent engine which suits everyday use just fine, and is quite enjoyable to drive as well for the size. 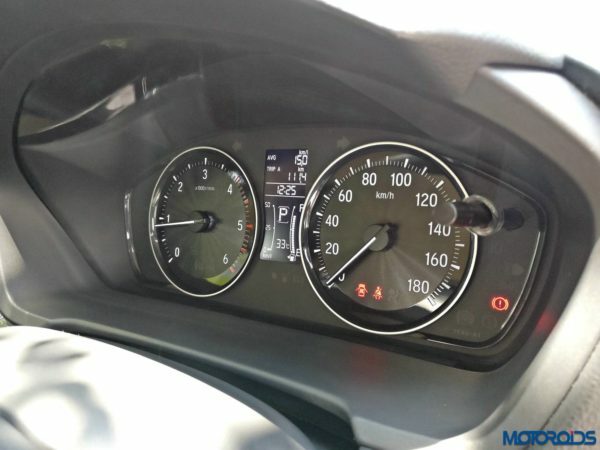 For limited city use, where you don’t wish to log too much mileage on the car, it’s one of the finest petrol motors and there’s nothing going against it. Reliable, smooth, and nice-sounding as you rev it hard, the 1.2 petrol motor is a no-brainer. It’s mated to a five speed gearbox, with a nice to hold small gear knob and short, sporty throws. The gearbox is reasonably slick, though there is still a wee bit of notchiness to it. 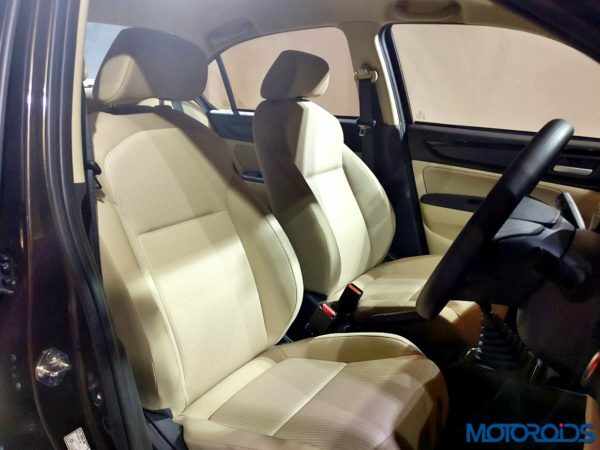 Nothing worth a worry though, and the 1.2 petrol – manual is one of the best options of its kind in the segment. The petrol motor also gets a CVT option, replete with paddle shifters. You get the option only for the mid S and V variants though and the top VX variant doesn’t offer the option, probably to ensure that the overall price band is not too wide. The one on the petrol is like a step CVT with predefined 7 ratios which can be swapped using the paddle shifters. It’s essentially meant for convenience more than anything else though. The fuel efficiency hasn’t taken much of a hit on the CVT variant, and is rated at 19.0 kmpl, only 0.5 kmpl less than the manual version. There is that CVT specific noise as you rev, the engine doesn’t rev to its redline with the CVT on, and the progress on the speedo too is a little slower as compared to the manual. For part throttle, this one works fine, in a seamless, jerk free manner, and is a good option if you want convenience. 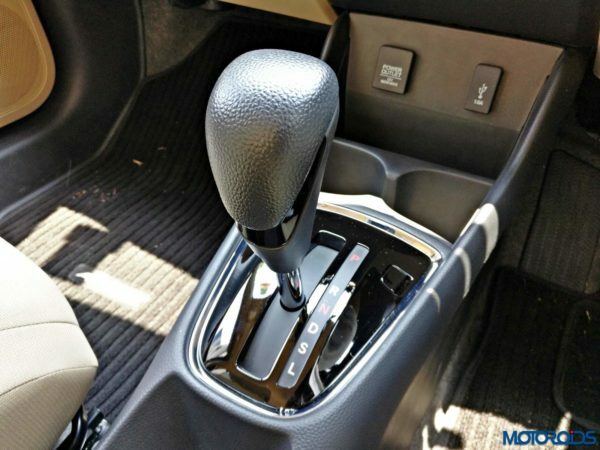 It’s a very nice option if you wish to drive comfortably without having to work the clutch. There’s a Sport mode too, which increases the revs for any given vehicle speed to improve available power and response, and better acceleration if you press the pedal thereon, though it doesn’t feel, well, too sporty. It’s not for the enthusiasts among you, though. The diesel engine on the Amaze has undergone even more rigorous changes than its petrol counterpart. The primary effort of Honda with this unit was to cut the noise, reduce friction and make it more efficient. The design of the pistons, block, oil pump and chain system has been changed to achieve that target. Friction reduction coatings have been used in the engine and urethane material has been used in the engine head cover. With all those changes, while the power and torque output remains the same as before at 100PS @ 3600 rpm and 200 NM @ 1750 rpm, the fuel efficiency now reads 27.4 kmpl – which is almost as good as the best in the segment. From inside the cabin, one can feel that the noise has reduced too as compared to the previous gen Amaze, though this engine still has some scope for noise reduction. Not the most silent in its class, the engine sound does creep in more than ideal as the revs start building beyond 1800 rpm. That power figure is class leading, though the Aspire gets more torque. The great quality of this engine, though is its great tractability. Despite being a turbo, it feels very linear in natu7re, and doesn’t cough or splutter even at below-1000 revs, which is fantastic. This unit will trundle along all day long in city traffic at slow speeds and higher gears without a worry in the world. The push gets substantially stronger at 1500 revs, with the properly spooled up turbo offering solid acceleration at 2000 revs and beyond. The engine is redlined at 4000 rpm, which isn’t too revvy, and performance starts waning off after 3500 revs. 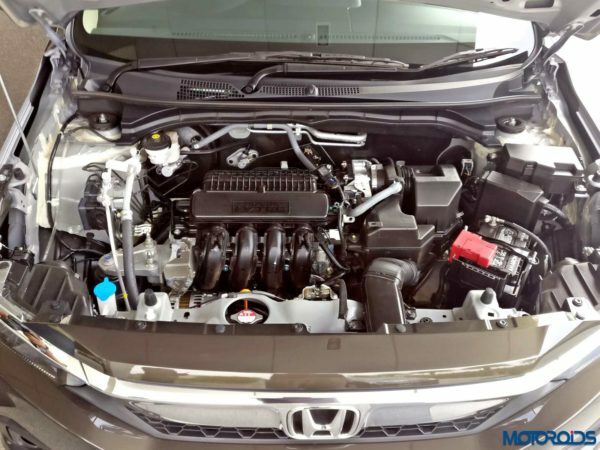 This is the first time Honda has used a CVT with a diesel engine worldwide. It’s also the first time a diesel engine has been offered with a CVT in India. It’s a ground up effort and is meant to offer the full spectrum of transmission choices for Amaze buyers. 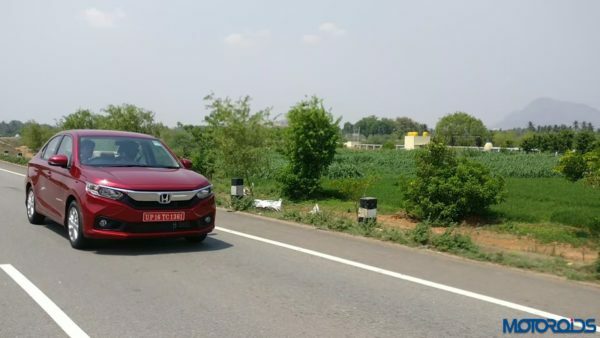 The diesel engine on the CVT variant, however, has been detuned to increase efficiency and achieve a smoother driving experience, according to the folks at Honda. The efficiency on the CVT diesel is down to 23.8 kmpl as compared to 27.4kmpl on the manual. Power is down to 80PS while torque has been reduced to 160NM. The CVT on the diesel also doesn’t get manual paddle shifters like the petrol and doesn’t show any gears on the MID, unlike the petrol version, which shoes 7 gears. 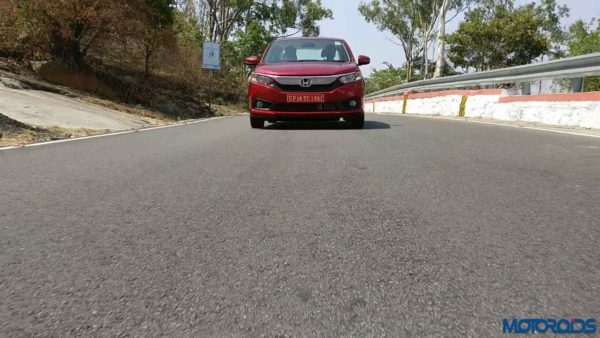 The diesel CVT also gets an additional LOW mode, which is meant to enhance engine braking while going down a slope, lug more weight or while climbing steep climbs. 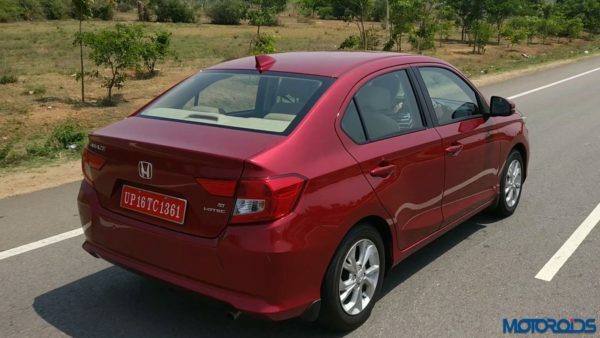 The diesel CVT too feels noisy and the progress isn’t rapid. The rubber band effect is quite evident, and the engine won’t rev higher than 3600 rpm with the CVT. The top speed here isn’t too high either and you won’t see any higher readings on speedo than 150 kmph. Like the petrol CVT then, the diesel is meant for comfort and convenience. 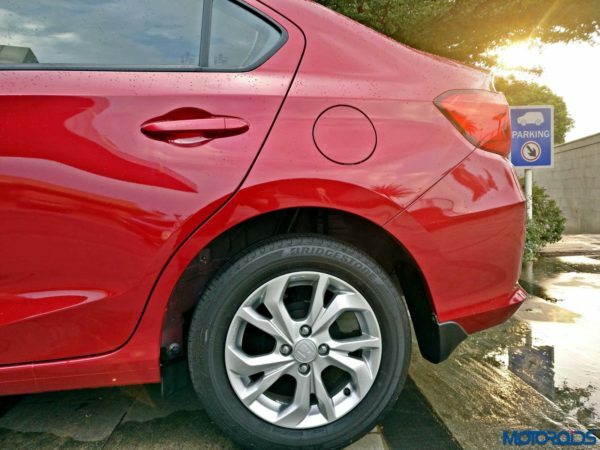 It shifts smoothly, without any jerks and offers a seamless driving experience. It’s a good option for those who wish to use the car for city as well as intercity use, with decent efficiency and without having to change gears manually. Again, it’s not meant for the enthusiasts. To start off, the chassis itself has seen comprehensive changes for better stiffness, safety and stability. The track is wider, the wheelbase in longer by a whopping 65mm and the car look bigger and more daunting than the model it replaces. The monocoque is not stiffer for better dynamics and safety. The rear suspension geometry has been changed for better shock absorption, and the damper angle too has been made straighter. In addition, a plethora of changes have been made to reduce NVH levels, and the cabin of the Amaze really feels devoid of any wind, tyre of ambient noise. It’s a job well done and Honda needs to be complimented for that. On the move, the Amaze feels significantly more planted. It rides like a proper, big machine, and boasts one of the nicest suspensions in its class now. 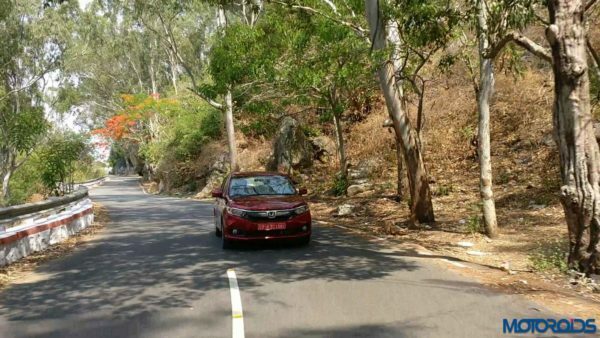 We loved the way it took some really bad, broken surfaces in its stride without a whimper on our way to Nandi Hills. Small to medium rough surfaces are dismissed with gay abandon, though the bigger ones can be heard as a muted thud. The bigger 15 inch wheels have also contributed in the enhanced ride quality, and the passengers would really appreciate the quiet cabin and the beautiful suspension, slightly on the firmer side, but very well damped, translating into great comfort for front as well as rear passengers. The handling has gone up a few notches too. The chunky steering feels very nice to hold and has just the right weight. It feels connected and allows you to place the car precisely on the road. Together, with the Amaze’s newfound poise that steering would make driving enthusiasts appreciate the Amaze a lot more than they did the previous version. The new Amaze is easy to chuck around corners, contains body roll very well, and the grip from the 175 section Bridgestone rubber is fabulous too. In all honesty, I didn’t expect the Amaze to handle very well when I set out for the drive, but it far exceeded my expectations when I showed it some twisties. 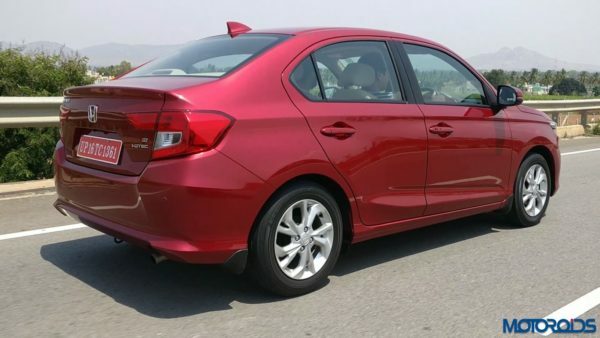 I would want to get behind that steering wheel again, and that’s saying a lot for a family oriented small sedan like the Amaze. The steering wheel on the petrol version feels slightly lighter than the diesel version though. Overall, the new Amaze is one of the best blends of good ride quality and dependable driving dynamics for its class. In terms of driving pleasure, it’s next only to the Ford Aspire, if we really had to put things into perspective. Save for that unconventional face, there’s nothing to not like about the new Amaze. It’s really a very comprehensive effort by Honda, and you can feel the sincerity with which they’ve worked on this car in every facet of it. What’s more, they’re putting their money where their mouth is, and are offering a staggering three years, unlimited kilometres warranty as standard with the car. Furthermore, a detailed presentation showed us how the frequency of the most commonly replaceable parts is lesser for the Amaze, as compared to competitors. Service intervals are longer, and if their study is something to go by, the overall cost of ownership is going to be noticeably lower than its closest competitor, which, BTW is the Dzire. While we believe Honda for the major part of all of that, we’re not going to take their word for it, and will wait for the time when the car actually performs on the street. 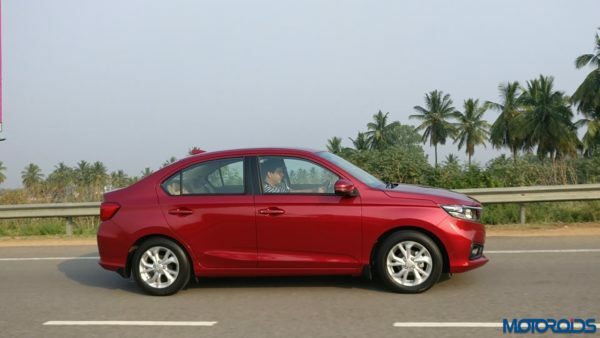 What we do know, however, is that the new Amaze, is indeed an amazing effort, and comes across as a very solid option for the segment, which after driving it, I would ask my friends and family to go and take a test drive before making a choice. It’s really a significant improvement, and one of the strongest contenders in its segment going by the product qualities. 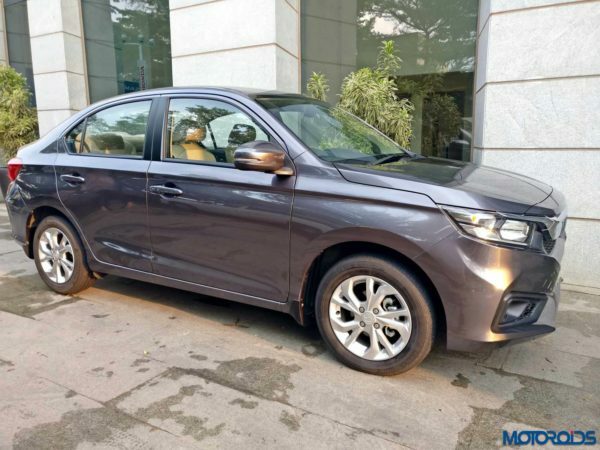 The automatics may cost a lot more than the respective AMT versions, though the manual transmission will throw a serious challenge to the Dzire, is what we strongly believe. The prices have not been announced yet, and we’ll reserve our final verdict until the prices are announced. Until that time, what you need to know is that the new Amaze, as a standalone product for its class, is really Amaze-ing. Well done, Honda!